Which Segment Of The Housing Market Is Most Active? Things are looking up for the Tallahassee housing market. The hottest segment of the Tallahassee housing market is occurring at prices and values near the median, while the higher and lower end of the markets still have a ways to go. This weekend, I decided to update some of our best housing market snapshot graphs to include "median" records for the past ten years. As a reminder, the difference between "average" and "median" in the real estate market is that the average home value is found by adding up all the sold home values in the market and dividing by the number of homes sold, whereas the median is simply the value of the home in the middle of the list (sorted by value). Because it is so easy to report averages (and computing median values requires far more effort), most real estate reports rely on average prices and average values in the housing market. But that won't be the case today. 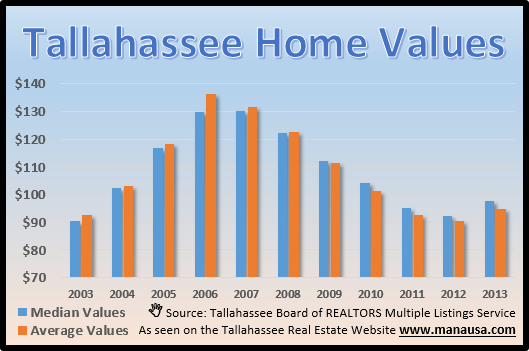 The real estate graph above shows both median and average values in the Tallahassee housing market. The blue bars show the reversal in direction with the median home value in Tallahassee thus far in 2013 is at $95 per square foot. Note how median home values were below average home values from 2003 through 2008, but switched from 2009 to 2013. What does this mean? Which End Of The Housing Market Is Most Active? The simplest way to understand what we are seeing in the graph above is by way of a simple exercise. ($100K + $125K + $145K + $170K + $195K + $210K + $225K + $800K). The average of these sales is $246,250, whereas the median is lower at $182,500. ($25K + $185K + $200K + $215K + $230K +$245K + $260K + $275K). The average of these sales is $204,375, whereas the median is higher at $222,500. In the first case, when the median value was below the average value, a really high sale (abnormal) skewed the average well above the median. In the second case, a really low sale (abnormal) skewed the average well below the median. Thus, I believe our graph shows first the heating and then the cooling of the very high end homes market. Specifically, it allows us to observe that the impact of "abnormal sales" (where values are far from the median) has shifted from the high end to the low end. I wish that I were wrong. The remaining glut in the Tallahassee housing market is at this higher end, and we won't find market equilibrium until we can clear the excess inventory of homes for sale in the Tallahassee MLS. If you think it might be time to sell your home, simply drop me a note and we cans schedule a time to analyze your home and your specific situation in order to give you the accurate guidance that you need to prevail in this changing housing market. Thanks Joe for peeling back the layers to better understand the local Tallahassee market. Great post.